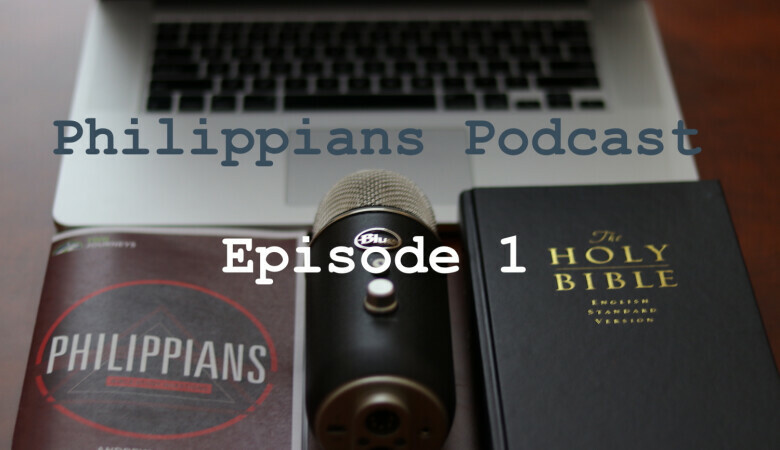 00:03 Joel Harford: Welcome to the Two Journeys podcast, this is episode 4 of the Bible Study Questions in Philippians. Today, we're going through Chapter 2:12-30. I'm your host, Joel Hartford and I'm here with Pastor Andy Davis. 00:17 Pastor Andy Davis: Yeah, this is a phenomenal section of Scripture. I mean, even from the very beginning, talking about working out your salvation with fear and trembling, and sense of that progress that we have and the internal journey of sanctification and also combining it to some degree with evangelism shining like stars in a darkened universe… And then just singling out laborers Timothy and Epaphroditus, so this is going to be a good section to study. 00:38 Joel: Well, for the sake of our audience, I'm going to read verses 12-30 out of the ESV. "Therefore my beloved, as you have always obeyed, so now, not only as in my presence, but much more in my absence, work out your own salvation with fear and trembling, for it is God who works in you, both to will and to work for His good pleasure. Do all things without grumbling or disputing, that you may be blameless and innocent, children of God without blemish in the midst of a crooked and twisted generation, among whom you shine as lights in the world, holding fast to the word of life, so that in the day of Christ, I may be proud that I did not run in vain or labor in vain. Even if I am to be poured out as a drink offering upon the sacrificial offering of your faith, I am glad and rejoice with you all. Likewise you also should be glad and rejoice with me. I hope in the Lord Jesus to send Timothy to you soon, so that I too may be cheered by news of you. For I have no one like him, who will be genuinely concerned for your welfare. For they all seek their own interests, not those of Jesus Christ. But you know Timothy's proven worth, how as a son with a father, he has served with me in the Gospel. I hope therefore to send him just as soon as I see how it will go with me, and I trust in the Lord that shortly I myself will come also. I have thought it necessary to send to you Epaphroditus my brother and fellow worker and fellow soldier, and your messenger and minister to my need, for he has been longing for you all and has been distressed because you heard that he was ill. Indeed he was ill, near to death. But God had mercy on him, and not only on him but on me also, lest I should have sorrow upon sorrow. I am the more eager to send him, therefore, that you may rejoice at seeing him again, and then I may be less anxious. So receive him in the Lord with all joy and honor such men, for he nearly died for the work of Christ, risking his life to complete, what was lacking in your service to me." So I'm going to go back, Andy, to verses 12-13, where they're told to work out their own salvation with fear and trembling. And that these are some of the most important passages in the Bible on human effort and sanctification. So what are these verses teaching? 03:04 Andy: Well, first and foremost, they teach me that salvation is a process, that we are not done being saved, that every one of us who's alive here on planet earth, who are believers in Christ that we're not done being saved, we have a journey to go in our salvation, that's where the two journeys aspects come from, the internal journey of sanctification. There is a process to salvation in this world, and frankly, not even those that are up in Heaven are done being saved because I believe they haven't received their resurrection bodies yet, they're waiting, they're absent from the body, present with the Lord. They don't have any more working out to do of their own salvation. They're waiting, but they're not done in that they haven't received their resurrection bodies yet, so how much more are we who are still on earth, who are in danger assaulted by the world, the flesh and the devil. We've got some work to do, and it's with fear and trembling. 03:49 Andy: So first and foremost just the idea of salvation is a process, but also, it's a joint process in which our effort and the work of the Holy Spirit in us go together. It's a partnership. Sanctification is a partnership between the individual Christian and the Holy Spirit and this verse, this section that we're talking about here teaches it very plainly. 04:12 Joel: Now, we don't want to confuse working out our salvation with working for our salvation, because Paul says in Romans 3:20, that "no one is justified by works of the law." So how do we steer clear of the error of working for our salvation, but then obeying Paul, and working out our salvation? 04:32 Ansy: Well, we just need to make those clear theological distinctions between justification, sanctification, and glorification, and the role that human works play in each. First on the issue of justification we learn that we cannot be forgiven of our sins by our works. There are no works we can ever do at any point in life, to be forgiven for our sins, or to earn forgiveness of sins. That's impossible. That's justification by works and that the Bible rejects. So we have learned to reject that as well. Our forgiveness of sins, even now even today, as we imperfectly try to be sanctified, we're going to mess up, we're going to say things we shouldn't say, do things we shouldn't do, we're going to have sins of omission, there are things we should have done and didn't do. 05:14 Andy: All of those sins would be covered by grace through faith in Jesus Christ, Him crucified, and resurrected. And no other way. However Salvation is bigger than justification. Justification is just a part of salvation and so when we get into sanctification, the rules of the game change, this is a clear verse that teaches it. And Roman 6 through 8, teaches it as well, culminating Romans 8:13 it says, "If you by the Spirit put to death the deeds of the body you live." So we have a role to play in sanctification, so we avoid the confusion by being precise, theologically precise. Justification, namely the forgiveness of sins and the establishment of a right relationship with God we as sinners, that only happens by grace through faith and our works have nothing to do with. But sanctification which is the progressive growth into Christ likeness, our effort is huge, we must make works or we will not grow. 06:03 Joel: So we must work then for our sanctification, or you're saying that we will not grow at all. So what happens if someone declares that they believe in Christ, then there's no effort in sanctification? 06:15 Andy: I would say that they are deceived. I would say often, Paul says, "Do not be deceived, God is not mocked. You reap what you sow." Look at the fruit. Hebrew 6, a very famous passage which some people think teach that you can lose your salvation. Actually it doesn't, it says to just look at the fruit. The land that drinks in the rain often falling on it produces thorns and thistles is worthless, it's in danger of being cursed and in the end it will be burned. That's language of condemnation. Jesus put it this way, "I am the vine and you are the branches." And He said, "If anyone remains in me he'll bear much fruit, and so prove yourself to be my disciples." It says that the Father, the vine dresser, cuts off every branch in me that bears no fruit, and those branches are collected, and burned in the fire, again a picture of hell. So if somebody is literally fruitless, spiritually fruitless, they are not alive, they're not born-again. 07:03 Joel: So I think of Paul in 2 Corinthians where he tells us to test ourselves to see whether you are in the faith. This would be a good way to test ourselves and to see if we're making progress in sanctification and to see if we're working out our salvation. 07:17 Andy: Absolutely, and the fruit that we're looking there is not just actions, but there's also attitude fruit, both of those things are important. 07:25 Andy: Exactly, fruit of the spirit or as it says there in 2 Peter, if you add to your faith goodness, and to goodness knowledge, and knowledge self-control, self-control is an inner trait of character that results in certain actions, or... And it results in a disciplined pattern of life. Anyway there's all kinds of fruit that the New Testament talks about but we need to be growing in all of those things. And so without the fruit, I would say, there's just no life. 07:47 Joel: Amen. Now what about this "fear and trembling"? Because there are verses for example, in Romans 8:15, it says, "We did not receive a spirit of slavery to fall back in fear" or first John 4:18 which is, "Perfect love casts out fear." But it says, "Work out your salvation with fear and trembling." 08:03 Andy: Right. Well I think people can take those 1 John verses too far. Throughout the Bible the fear of the Lord is presented as a good thing. It's the beginning of wisdom in Proverbs 1:7 and many other places, we want to grow in and develop fear of the Lord. So there's a healthy fear of the Lord. It also says the same thing in Romans 8, that we should not fear condemnation from a capricious God. God is not going to betray his own promises, and his own principles, he's not going to, for no reason at all, just because He's sovereign, He is the king, cast us into hell. That is not at all the case. We don't need to fear such a capricious and judgmental tyrant. That's not who God is. And so 1 John and Romans 8 are causing us not to have that kind of fear. But that doesn't mean we shouldn't fear God, fear his holiness. We should fear his disciplines for sin, we should realize that God has sometimes caused some of his children to die physically, and brings them to Heaven because of a discipline for sin. 09:02 Andy: We also realize that some people get sick, other people have financial reversals or other issues come in their lives. David had certain very stern disciplines from God for certain patterns of sin that he had in his life, and so I fear that. I think we should all fear sin, we should fear what sin can do to us, and we should have a certain sense of seriousness about our lives, fear and trembling. I think there's also just a sense of the seriousness of spiritual things, that we are to be those that tremble at God's word it says in Isaiah, I think 66 where it says, "This is the one I esteem, the one who is humble and contrite in spirit and trembles at my word." You think about Isaiah who saw the Lord high and exalted, seated in his throne, he said, "Woe is me," and there's that sense of the awe and the majesty that is appropriate and a part of the fear of the Lord. So we should work out our salvation with a sense of fear and trembling toward a holy God, and the danger that we're in because of the world, the flesh, and the devil. 10:00 Joel: Now, you do speak of the danger, of the world, the flesh and the devil. Verse 13 presents us something far greater, it says, "For it is God who works in you, both to will in and to work for His good pleasure." So what is then God's role in our sanctification? 10:13 Andy: Yeah, and I also want to zero in on another verse that says, "Greater is He that is in you than he that is in the world." We should fear the world, the flesh, and the devil, but the Holy Spirit's greater. And when the Holy Spirit enters your life, He will not let you go. He is God, He will not lose. So the clear assertions if we are indwelt by the Spirit, we will not be given over to our sins, the Holy Spirit will triumph, He will sanctify us and He will get us to Heaven. So it is God who works in us, we should add in our minds, through the Holy Spirit, that's what the Spirit does, the Spirit of truth, the Spirit of holiness, He works in us. It is God who works in us to will and to act or do according to His good pleasure, His good purpose. 11:00 Andy: So we are called on to work out our salvation, to grow in Christ-likeness but we find that the Holy Spirit is already ahead of us. He'll always be ahead of us, we are always following him because it says in Romans 8:14, "Those who are led by the Spirit of God, these are the children of God." He's always ahead of us, we're never ahead of him in holiness, never of course not, he's the third person in the Trinity and perfectly holy. So he's ahead of us and he works in us. Now look what it says that he does, he works in us both "to will and then to do according to His good purpose." Now, let's go to the end, "His good purpose." I think for our intentions here is the word of God or the law of God, he works the spiritual law in us, like the Psalmist in Psalm 119 says, "I run in the path of your commands because you have enlarged my heart and set my heart free." And so, we are delighted in God's law, we find it beautiful, as Jesus summarized the law of God, the moral law, which is to love God with all your heart, love your neighbors yourself and then all the implications that come from that. 12:00 Andy: The Holy Spirit works the law of God in us, as it says in Romans 8:4, "in order that the righteous requirements of the law might be fully met in us, who do not walk according to the flesh, but according to the Spirit." So he works in us to fulfill God's moral law day after day after day. And that moral law is explained in many Epistles, here in Philippians and in other places. Honestly the context here is of harmony and unity within the body of Christ of considering other needs ahead of your own, of not being selfish, of not being prideful. That's what he's talking about here, that's what working out your salvation means for them, get along with each other, be humble toward each other, consider other people's needs ahead of your own, that's a matter of sanctification. He says, "Now the Holy Spirit is going to work in you to will that, he's going to make you want to do that and then he's going to work in you effectively to act in, so you actually do become holier by the power of the Holy Spirit. 12:52 Joel: That's incredible. Now, verse 14, he says, (you're talking about growing in holiness), he says, "Do all things without grumbling or disputing." Why are we so prone to grumble? I know that you, in a book you're writing, you talk about the evils of the murmuring spirit… Why are we so prone to grumble and how do we really turn our attitudes around and do things without grumbling or disputing? 13:15 Andy: Yeah, well he's going to return to this in chapter 4 with learning to be content in any and every situation, but also it has to do with the overall context here of unity, within the body of Christ that they are to stop disputing or arguing with each other, and they're to stop complaining and grumbling. The most common word is complaining, so do everything without complaining or arguing. I'll tell you why. You look at that verse, Philippians 2:14 like someone once said, "I understand what that verse is saying, I just can't seem to live it out." Imagine going through a single day in which not once did you complain, and not once did you argue with anyone. Specially if you're married, you have a close relationship, the temptation to complain towards each other and to argue with each other is very strong. 13:58 Joel: Complain about the kids… Complain about the bad attitudes… Yep. 14:01 Andy: Yeah. The weather patterns, everything. We grumble about a lot of things and Paul says it should be just completely eliminated. Because fundamentally we are called on to praise and worship God and give Him thanks in all circumstances, and so grumbling and disputing these things are diametrically opposed to a life of thankfulness, and of unity with one another. So this is the first kind of ethical aspect of working out your salvation with fear and trembling to the end that you stop arguing, complaining. By the way, James tells us that the tongue is a restless evil full of deadly poison. There's a lot of bad things we do with our tongues and these are two of the verbal patterns we have to get rid of. We've got to stop arguing and we've got to stop complaining. And James says if you can do that, and all the other bad things, get them eliminated, you're a perfect person, able to keep the whole body in check. So he's really challenging the Philippians here to stop arguing with each other, and to stop complaining about things in life. 14:58 Joel: And he says be "blameless and innocent children of God without blemish. In the midst of a crooked and twisted generation, among whom you shine as lights in the world." This reminds me of in Matthew 5 where Jesus says that, "You are the light of the world, a city set on the hill." So these ethical commands are not just for the believers alone… It's because they're going to be seen by the world. So can you explain how our internal journey or walk with Christ, how we treat our brother and sisters then is actually crucial to our evangelistic endeavors in our community? 15:34 Andy: Well Joel, it's just so beautiful that you put those two together because this is the Two Journeys website, it's the Two Journeys podcast and the two journeys are absolutely intertwined, they're interconnected. The internal journey of holiness and the external journey of evangelism and missions they absolutely go together. So for me as an evangelist, if I'm actually active in shining like a star in a dark generation, there's some work of holiness that has gone on in my life already. And how much more a local church, a congregation. If we really are loving one another like Philippians 2:1-11, that whole section on considering other needs ahead of your own, not being motivated by vain glory or selfish ambition, vain conceit, and your mind is the mind of Christ, who is so humble and if they do everything without complaining or arguing and it's a very strong loving godly community of people working out their salvation with fear and trembling, that's going to be very powerfully evangelistic effective. 16:39 Andy: People are going to come in and say you folks are unlike any group I've ever seen, and they're going to want to know what the secret is, they're going to want to come in. So there's a strong connection between our holiness, our growth in holiness, sanctification and our evangelism. So he says that he wants us to be blameless and pure children of God without fault. So that has to do with people who don't argue or complain and then all the other aspects too. We are sexually pure, we are not enslaved to any habits, we are living for the glory of God. We're shining like stars against a black sky. And that's what it's like, it's mostly night. The God of this age has blinded the minds of most people. So for them it is spiritually dark. But we're shining and we're able to shine with the light of Christ in a very powerful way. 17:28 Joel: Yeah. People often reference in 1 Peter where he says, "Always being prepared to make a defense to anyone who asks you for a reason for the hope that is in you." And sometimes we focus a lot on the defense, but there's also the hope. We need to shine and radiate with the hope, so that people will ask. 17:44 Andy: Yeah, and also keep in mind what he says here, he's not complimentary at all to our present generation, it's crooked and depraved. It's a depraved generation. That's the truth. It's true in our day as it was in Paul's day. So unconverted people are crooked and depraved just as we were, we are no better than them. But we want to rescue them, we want to be a light shining in a dark place, to show them their own depravity, their need for a Savior and point them to Christ. 18:10 Joel: Now Paul says he wants to be proud that he doesn't run in vain or labor in vain. What would have made his running be in vain? 18:20 Andy: Well, Paul was always concerned that the tempter, Satan, would come in behind him, and tempt the people and draw them away from a sincere and pure devotion to Christ, so that they would cease to exist as a church, go back into their old pagan life. And so he was frequently, I would want to say, anxious for them. He was zealous in concern, you see this in 1 Thessalonians, when Timothy comes and brings a good report of the Thessalonians and he is concerned about the Corinthians that he is afraid that they, like Eve in the Garden of Eden, were tempted out of their sincere and pure devotion to Christ. 18:55 Andy: It happens a lot. He says to the Galatians that he is in the pains of childbirth until Christ is formed in them. He's very anxious for them. And so fundamentally, he is concerned that he wasted his time on the Philippians, but he is confident of better things in their case and that God is going to protect them. And so fundamentally he's, on the opposite from being ashamed that he wasted his time, he's going to have the ability to boast on the day of Chris. He uses this word a lot. To glory in the day of Christ, that He didn't run or labor for nothing. Running, as he uses this image a lot of a race. Run. He wants to finish the race and complete the task. Lord, Jesus, I fought the good fight, I finished the race. So that's the task of evangelism, of planting churches, or a labor. He labored on these churches. He worked day and night to do discipleship and evangelism, and to teach them and preach and even till late in the night, sometimes teaching them. He said, "Well, it turns out I didn't run or labor for nothing, because Christ has been formed in you." 20:00 Joel: So you speak of the labor and that brings us right into Timothy and Epaphroditus, and he tells them His plans that he wants to send Timothy and then Epaphroditus to them. How does he describe Timothy, and how does this description that he gives of Timothy really challenge us? 20:16 Andy: Well, these are his choice, beloved, co-laborers. These are individuals that are working with him and he's later going to talk about Euodia and Syntyche who have labored with him in the cause of the gospel, and so he has brothers and sisters in Christ that share his zeal for the Kingdom of God. Maybe they don't share his gifts or his calling as an apostle but they do share his zeal and his love for the building of the church. And Timothy was probably his closest friend in this world, and his protege, he was his son in the faith. He was somebody that he was pouring into. We learned about him in Acts 16. He had a Jewish mother and a pagan father, and the father seems to have had no positive impact on him spiritually. But his grandmother Lois, and his mother, Eunice, poured into him from infancy, we learned in 2 Timothy about him, and Paul loved him, and he was his co-laborer. Here he describes his working with Paul like a son with his father. And so there is a cherished father-son relationship here where the son would imitate the father and do the things that the father was doing. 21:23 Andy: Now keep in mind Paul was incarcerated, he's in chains and he can't get to visit them, and so he's going to send somebody who's free, Timothy. And he hopes to send him soon because he wants to receive news. They didn't have cell phones back then, they didn't have the internet. He was in the dark. He didn't know what was going on with the Philippians and so he wanted to be cheered up when he received news through Timothy. 22:02 Andy: No, he's not, kind of... Well, one of the translations says, "Everyone looks after his own welfare," and I think that's our home base. When I think about the flesh, I've said this before that the flesh, the essence of the flesh is fanatical commitment to self-interest. I think infants come into the world, and it's hard wired and it's part of the original sin. They're fanatically committed to what they want. They want to eat, they want a clean diaper, they want to sleep, they want the toy. It's fanatically committed to self-interest, and the Gospel alone can wean us off of that fanatical commitment to self-interest and teach us to live for God and for others. And Timothy has learned that, it seems. He's learned how to have a genuine interest in the spiritual welfare of others. And he says, this is actually pretty rare, Timothy has a genuine interest in their spiritual welfare, and so that's why he wants to send Timothy to them because he wants somebody who really loves them. 22:55 Andy: He loves his church, his Philippian church. He won't be able to visit them, but he wants to send somebody who is so passionately committed to seeing Christ formed in them, and see them grow in grace and knowledge of Christ. 23:06 Joel: Yeah, it seems like he's putting Timothy and Epaphroditus up as examples of the kind of behavior he's encouraging them towards in the beginning of the chapter. 23:14 Andy: Yeah, and he says, Timothy, has proven worth, he's been through the fires. He's a tested seasoned warrior. He's later going to call Epaphroditus his fellow warrior. And Timothy was that, too, though he was a bit very tender-hearted guy. I think he was the kind of guy who was tempted toward timidity, pulling back, fear of man, these were the issues for him as Paul addresses in 2 Timothy. But at any rate, he talks about Timothy's proven worth or he has proved himself in the work of the Gospel. 23:41 Joel: Now it seems like Paul thinks he's going to get out of prison, beause in verse 24, he says, "I trust in the Lord, that surely, I myself will come also." 23:48 Andy: Yeah, he kind of worked that through in chapter one. So he figured, kicked it around. Am I going to depart and be with Christ? Or am I going to stay here? And he says, "Convinced of this. I know that I will remain." So he's kind of acting on that. I don't think he knows ultimately, unless the Lord has spiritually revealed it to him. But at any rate, the idea is he wants to get some news before he's released, and then he is going to send Timothy with the news of what's gonna happen with him. So if it seems like Paul is going to be released, Timothy can bring that news. And then as soon as he is set free and is able, he is going to follow and come visit them again. 24:21 Joel: Now what about Epaphroditus? This is an incredible guy in the New Testament. What did he do? How did he serve both the Philippians and Paul? 24:30 Andy: Well, here in this case, he is their messenger. Paul says he was sent to take care of his needs. We're going to find out in chapter four that they had sent money to him to care for his needs in prison. 24:43 Andy: So keep in mind, back in the first century, the prison didn't feed you, the prison didn't provide clothing for you or blankets for you, the prison just locked you up. And if you were going to survive and have food, clothing, and water, and other needs, friends and external networks, system of support would have to be set up frequently. This is the way persecuting governments, governors, and kings would use one or two Christians to catch the rest. Because it would take a tremendous amount of faith and courage to go visit a fellow brother and sister in Christ when they're in prison. 25:18 Andy: But at any rate, Epaphroditus was the messenger who brought the money. And he's going to celebrate that and be thankful for it in chapter 4. He's thankful for the gifts that they sent. Well, Epaphroditus, it seems, was the one who brought the money and he's going to send Epaphroditus, he says, "I think it's necessary to send Epaphroditus back." And he calls him my brother, fellow worker, and fellow soldier, who is also your messenger, so he's a lot of roles. So toward Paul, he's a brother, brother in Christ, he's a believer in Christ, part of the spiritual family, he's a fellow worker, he's a laborer in the Gospel and a fellow soldier, a warrior. So there's a lot of good things he has to say about such an honorable man as Epaphroditus. 25:57 Joel: And he says he wants to... He's eager to send him that he can rejoice, that they'll rejoice to see him again. And then it's interesting, he says, "That I may be less anxious." And it's an interesting word because we know that later in chapter 4, he's going to say, "Do not be anxious about anything." And I think we can distinguish between different types of anxiety, but what do you think, Paul... What do you think is the good healthy type of anxiety where, you know, Paul talks about his anxiety for all the churches and in 2 Corinthians but then that kind he's rebuking us for when he says, "Do not be anxious at anything." 26:30 Andy: Well, I mean, in the context he talks about Epaphroditus' illness, and he almost died. He got sick and almost died, and then he, Epaphroditus was worried that the Philippians had heard about it, and he was distressed, he didn't want them worried. So, Epaphroditus is a very other-centered guy. But meanwhile, Here's Paul in prison pretty much unable to do anything for a sick dying brother. And you can well imagine, here's a guy that these beloved Philippians sent with money. And prisons were nasty places, and you could imagine all manner of diseases. People hacking and coughing and they're in their own filth and it's just an awful place. 27:16 Andy: And it seems like he picked up some kind of an illness while he was there and it seems that Paul felt that because of Epaphroditus' commitment to Paul, he risked his life to come into a prison. He risked being in prison himself, guilt by association. And then, he risked getting sick. And it seems like he did get sick. He did, and he almost died. And so there's the anxiety, it's like, "I don't want this brother to die. I'd be devastated." And so he's laboring in prayer, probably praying until the fever broke maybe, or something, and then finally, he's feeling better. And so "I want to send him back so I can have less anxiety about Epaphroditus." I want to say actually one other thing about that, too, he says, "Not only that I may have less anxiety, but God spared his life to spare me, namely, Paul, ‘sorrow upon sorrow.’" Now that's an interesting word. You mentioned the anxiety, but think about the sorrow. One of these central commands of this epistle is rejoice. Rejoice in the Lord. He actually says it earlier in this chapter, he says back in verse 17, he says, "I am glad and rejoice with all of you, so you too should be glad and rejoice with me." 28:21 Andy: But here he's talking about sorrow upon sorrow. So I think there's a key text and I don't remember exactly where it is, but in 1 Corinthians maybe or 2 Corinthians, he says, "Sorrowful yet always rejoicing." So I think the Christian life, that's a characteristic. There are occasional times of sorrow, even deep sorrow. And for Paul it was sorrow upon sorrow, lots of sad things. But the joy was greater than all of it. Because the sorrow is light and momentary compared to the eternal joy of being worked. And so when he says, "To spare me sorrow upon sorrow," he's talking about the sorrows of laboring for people's souls, but also the practical concerns of Epaphroditus' illness. 29:03 Joel: Now, he does say receive men of Lord with all joy and honor such men. What is the place in the church for honoring men and showing genuine honor for those who have suffered well, for Christ, but then also not taking it too far and really idolizing leaders with clay feet. How do we walk that road properly? 29:26 Andy: Well, you set up a good limitation there by realizing all of our heroes are flawed, people other than Jesus. Jesus is not flawed in any way. But everyone sins. And so we need to recognize that all of our heroes, men and women are sinners saved by grace. However, we can honor our leaders, we can follow their example, we can, and it says in Hebrews 13 to consider the example of those who spoke the word of God to us. Consider their faith and imitate them, the outcome of their way of life and imitate their faith. 30:05 Andy: So I think the idea of honoring is reasonable for us to say "thank you" to people that have served us well. Brothers and sisters who have sacrificed and labored and have done great things. You think about Dorcas/Tabitha who made clothing for women and the women were standing around Peter and showing Peter, all of these wonderful garments that Dorcas had made for the them while she was still alive. They honored her. And we think about other men and women who do honorable things. So, I think local churches should honor sacrificial service. But we can go too far. Here, First Baptist Church of Durham, we've gotten away from the habit of naming rooms after people and putting plaques on the wall or putting just monuments out in the garden or something like that with people's names on it, those who are significant donors or somebody that served for 40 years. 30:56 Andy: It's not helpful because it's an inducement to jealousy. Sometimes it creates an artificial goal, and we really should be seeking rewards in heaven. But I think we can go so far the other direction that we don't ever say thank you, or have some public times of honor. Actually, recently in our church, we honored a man that had served as well as an elder, and had been a veteran pastor for many years. And we all got around him and laid hands on him and prayed and thanked him as he was retiring as an elder, and honored him. And actually this was specifically the text that I read that day, and that I had in my mind that it was reasonable for us to honor that man. 31:32 Joel: Well, that's beautiful, Andy. I love that. And any final thoughts on this chapter? 31:38 PD: Sure, I want to go back to the beginning. And I want to urge everyone who listens to this to work out their salvation with fear and trembling, and I want them to do this knowing that it's a very serious thing that we have to keep making progress in holiness. If we stop making progress, we're going to slide back into sin. So we have to keep energetically moving ahead. But keep in mind, it is God who first works in us by the Holy Spirit, both to will and to do. So I would just urge you to meditate on Philippians 2:12-13 and then put it into practice right away with verse 14. Just have a day in which you say, "God, I want to have a single day in which I don't argue or complain all day long. I just want to do nothing but thank God and praise Him and speak words of encouragement and not complain about anything." So I just set that challenge before myself first and you, Joel, and all of us as we listen to God's Word. 32:25 Joel: Well, this is the Two Journeys podcast. Thank you for listening. Join us next time, we will look at chapter 3:1-11, and Paul's spiritual resume, how he rejects it in view of the surpassing value of knowing Christ Jesus his Lord. Thank you for listening, and God bless you all. Thank you for listening to this resource from twojourneys.org. Feel free to use and share this content to spread the knowledge of God and build his kingdom, only we ask that you do so for non-commercial purposes and in accordance with the copyright policy found at twojourneys.org. Two Journeys exists to help Christians make progress in the two journeys of the Christian life, the internal journey of sanctification, and the external journey of Gospel advancement. We do this by exporting biblical teaching for the good of Christ Church and for the glory of God.